Thought it would be interesting to make the same layout with opposite colors. They use Altenew's Botanical Garden. Not sure where the sentiments are from. White card: Stamped on Strathmore Bristol paper and used Zig Clean Color markers to add some color. Tried my hand at a thread nest. WHY? Pink card: Stamped same flower on same paper and colored around it, first Zig Clean Color marker and then, after it dried, with a Copic. See that black under the sentiment? It's glitter paper. MOOD WHEN DONE = Happy. Going up to Boston next week for a second opinion on my health issues. I'm grateful I can do this and that I got a quick appointment with a top notch expert. How can I even describe the gorgeousness here... they're both lovely but that first one is knocking my socks off. Wow! And good luck in Boston. I'll be thinking of you! wonderful idea, Joan - and love the dark pinks - and the gold thread is a perfect addition - best wishes for the Boston visit! 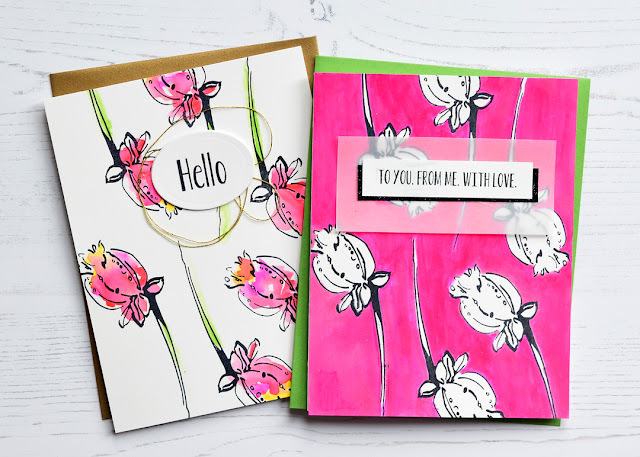 They are both amazing, but I love how you painted the flowers on the hello card. WOW! 😊 Best of luck on your trip to Boston. Hope you find some answers. Absolutely gorgeous-both of them. Coloring around that elegant rose was such a great idea. 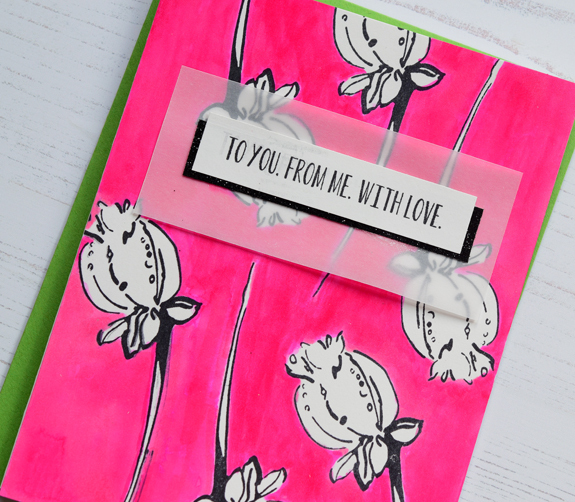 BTW-your sentiments are from Papertrey Ink, Mini Blooms stamp set. I use them both often. Gorgeous cards, love the pink coverage on the 2nd card, it's perfect. Thinking of you as you travel to Boston. Joan~ Wow, when your creative mojo flows it really does super. Love both cards. Best wishes to you. That shade of pink is wonderful! I love how you made the background, it looks so smooth, how do you get it like that? Maybe I need to invest in some zig markers? Using the glitter paper and vellum finishes off the cards beautifully. Good and positive thoughts going along with you to Boston! Love both these cards! Great designs & it's nice to see the different look with just a change in colors. Good luck on your Dr. visit!! Lovely cards. Enjoy seeing the same layout with different colors. I like the thread. Glad to see you are open to a second opinion. You will be in my prayers. Joyce, thanks. The Tombows are harder to find and more expensive per marker. I think I prefer the Zig for those reasons and because they are easier to blend. But I'm new to them so still not sure. 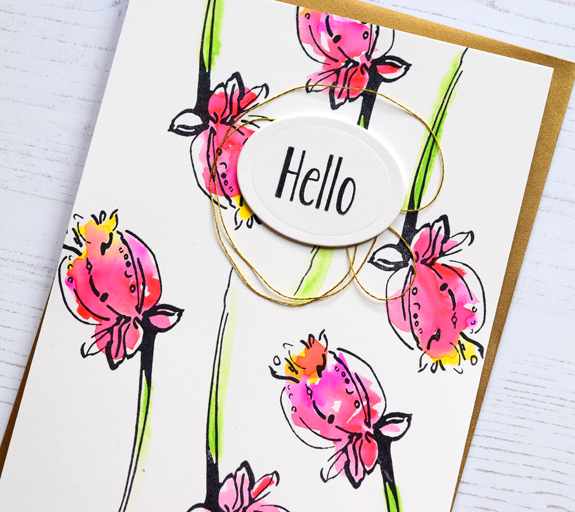 Fantastic colors all around, but the mix in the "Hello" card is gorgeous! Love the look. A thread nest and me would probably be a real mess. Wishing you good results with your doctor visit. If you don't like Boston, our EMT daughter likes the UMass Medical cardiology group in Worcester. It is where she would take us. thanks. I'm seeing the top expert in the field of my condition. Not sure I want to go, but I'm going!